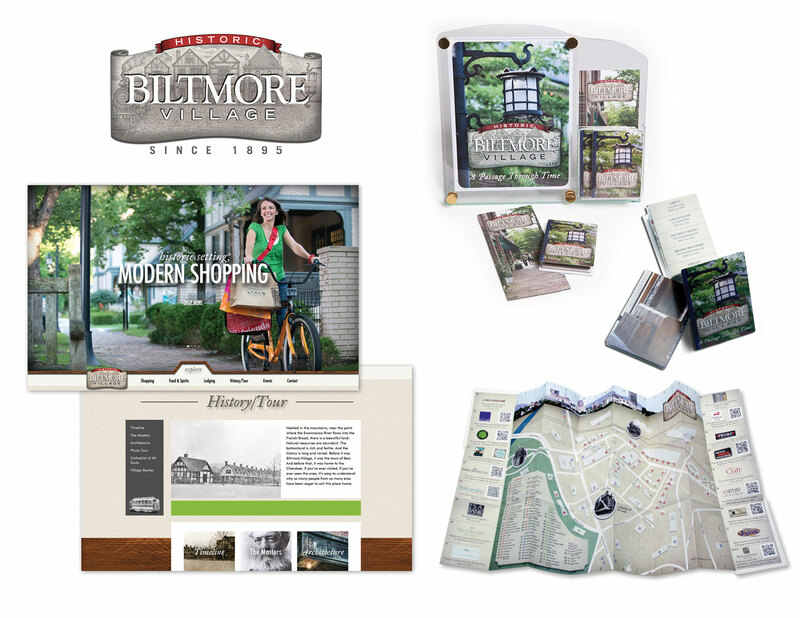 The Goss Agency, in conjunction with Biltmore Property Group, recently launched a branding campaign for Historic Biltmore Village located in Asheville, North Carolina in the heart of the beautiful Blue Ridge Mountains. The 120 year-old community branding campaign elements include a new logo, brochures, events, historic walking tour/shopping maps and a new website located at: www.historicbiltmorevillage.com. “This brand revitalization has contributed to an average sales increase of about 16% and has breathed new life into the Village, providing the missing and well-deserved image of an international quality leisure shopping experience with distinctive independent and national shops, restaurants and lodging in a relaxed, historic, charming setting,” said Curtis Williams of Biltmore Property Group. George Vanderbilt’s vision to accommodate the many artisans, craftsmen, gardeners, and staff hired to construct and maintain his estate, was designed by renowned American landscape architect Frederick Law Olmsted. Other well-known works of his include New York City’s Central Park, the Niagara Reservation in Niagara Falls and the Biltmore Estate, to name a few. The original Biltmore Village designs included a train station, grocery and hardware store, a school and church for the social and spiritual well-being of the residents, as well as many other shops and businesses to sustain everyday village life of 1898. Today the Village is still connected by charming cobblestone and brick sidewalks accented with landscape designs, many of which are preserved in the Library of Congress. Although much has changed in the last 117 years, Biltmore Village still retains its original Fredrick Law Olmsted design, which includes a direct view from the train station to the entrance of the Biltmore Estate and prominent All Souls Cathedral. When it comes to an elevated, leisure shopping experience, Biltmore Village is in a class by itself with relaxed historic character, charm and over 70 distinctive shops, art galleries, brewers, restaurants and lodging options, with a mix of independently owned and prestigious national brands operating out of historic buildings which have largely remained unchanged since their original construction. “It was truly a privilege to work with Biltmore Property Group on its vision to properly brand such a prestigious destination and historic site, associated with the unparalleled Biltmore Estate, which is a national treasure. Biltmore Property Group has its own impressive history too, revitalizing Biltmore Village over the past few decades, attracting ideal, quality national brands across many categories to Biltmore Village for the visitors and residents of Asheville. We are very honored to have had this opportunity and look forward to Biltmore Village continuing to enjoy the image and position it so well deserves,” said Jeff Goss, President of The Goss Agency. Biltmore Village was conceived by a visionary millionaire, designed by a world-renowned architect and became home to hundreds of modest Biltmore estate workers. It was a planned community as well as an independent community and has evolved and changed in the years since. Today it’s a one of a kind preserved piece of history which has grown into a bustling, contemporary shopping destination, home to both national retail outlets and one-of-a-kind independent shops. It’s the perfect night out for foodies and friends. It’s a must-see site for history buffs and architecture aficionados. It is, in short, a destination unlike any other.